The Cochran Calpac hot water boiler range shares many of the winning features of the Wee Chieftain steam range, reformatted to deliver exceptional hot water generation performance. With a reputation for robust design and reliability, Calpacs are in service around the world. The design is based on a three pass, wet back system with additional flexibility provided by the Calpac’s tolerance to high differentials in the feed and return temperatures of the hot water system. Typical applications include schools, hospitals, process heat and district heating schemes. 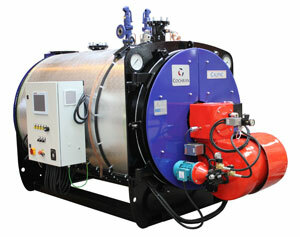 The Calpac range features low NOx, low noise Cochran burners as standard, backed up by a wide range of control options. Rating: 879 kW/hr to 3515 kW/hr (3×106 BTU/hr to 12×106 BTU/hr). Standard Working Pressure: 9.3 Bar, with designs available up to 27 Bar.